So really, you should just go make it now. It’s so good, it doesn’t even need icing!!! I had it for the first time when my lovely friend Sue had us over for dinner & made us “quinoa cake”. Now I love quinoa, so I was ready for a lovely earthy, and kind of grassy cake. But no. This is chocolate cake at its best — moist, chocolatey, and just sweet enough. I bought the quinoa cookbook Quinoa 365 based on this cake recipe alone. There are tons of other delicious recipes in there too — most of them savoury, and a few other dessert options. When I had a get together for my bridesmaids, I wanted to do a special dessert that wasn’t too decadent, and this fit the bill. As you can see, it was rather well received! 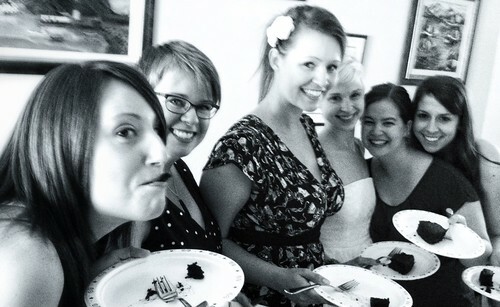 By the way, you should also have a professional photographer at your parties. My fabulous friend Michael runs MJS Photography and does awesome portraits and headshots. He took this candid shot of us ladies on his phone — and it’s one of my favourite photos!! In fact, it’s my phone’s background photo! Of course, based on my friends’ dietary needs, I made this cake dairy-free. And it was already gluten-free, so I didn’t have to worry about de-glutenizing it. I’ve decided that I like my version better than the original. I hope you do too — I think it may even be my birthday cake this year. If you haven’t got cooked quinoa on hand, 2/3 c. of uncooked quinoa will give you the 2 c. of cooked quinoa that you will need. I always cook up more quinoa than I need and keep it in the fridge to pop into soups and salads throughout the week. This probably doesn’t need to be said, but you want to cook the quinoa in water instead of in veggie stock for this recipe. I have a friend who cooks quinoa in orange juice for salads — I think that would work well here too! I think this cake would also do well for flavour additions: I could see adding orange zest, a shot of espresso, or even some booze (Cointreau or Grand Marnier?). It’s definitely my go-to cake right now, and I can’t wait to try it out as cupcakes. Maybe with a Chocolate Bourbon Frosting? Oh I can taste it now!!! Grease two 20cm (8″) cake pans with coconut oil, and line the bottom of each pan with parchment paper. Pour the batter into the two pans, and bake for 40-45 min. 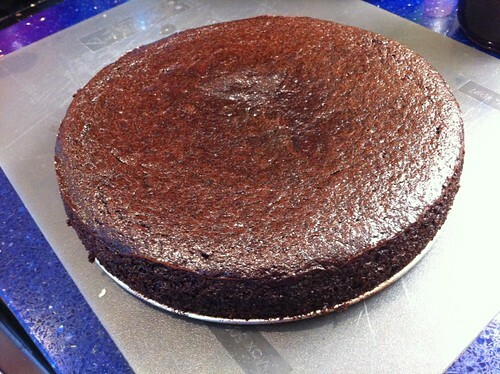 at 350F, until a knife or skewer inserted into the centre of the cake comes out clean. I’d like to try this with stevia – sometimes it works well, other times not so much in baked goods. We’ll see! Let me know if you do, Vinny. I don’t tend to bake with stevia as I find the aftertaste a bit off-putting, but I know you’d need to reduce the quantity significantly! Good luck! The secret is in finding a good-quality brand and then figuring out the proper amounts. So far I’m erring on too little. I don’t taste any bitterness in coffee, whipped cream, puddings… things that are very moist that require only a little sweetener. The problem is with baked goods where a large amount of sweetener is needed. Am getting there, though. 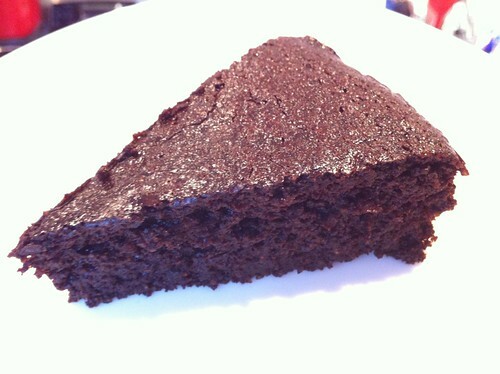 My skinny brownie recipe turned out GREAT! This looks delicious! It would be easy to veganize with egg replacer. Flourless, amazing! I’ll give it a try, thanks.